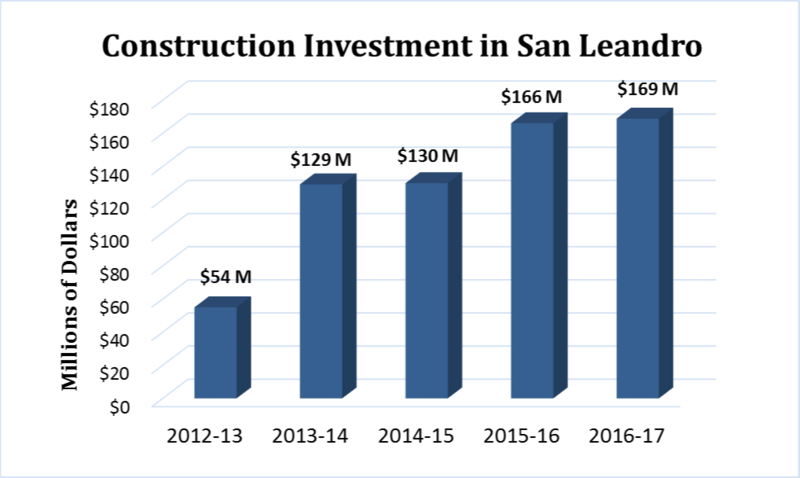 The City of San Leandro is experiencing economic growth, which is creating more jobs and generating more investment in the community. In response to this, Community Development staff is taking steps to help residents and businesses through the development process. San Leandro continues to attract investment, and the economic outlook is bright. While there is little vacant land, there has been ongoing interest in redevelopment of under-utilized properties and re-purposing of existing spaces. Over the past several years, San Leandro has experienced a significant amount of construction and development. Between 2012 and 2016, the number of building permits increased by 40%, reaching 2,500 in 2016. During this same time, the total value of construction increased by an impressive 208%, reaching almost $170 million in 2016. The Community Development Department is taking steps to facilitate development and is committed to improving customer service to help residents, businesses and developers through the permit process. In 2017, the Building Division completed a cost of services study, creating a new building fee structure that simplifies the application of fees to projects and assists customers in estimating permit fees. Now the new building fee schedule calculates fees based on construction valuation, allowing more accurate and expeditious calculation of fees and enabling residents, contractors and developers to easily project fees for proposed projects. Other efforts to improve the building permit process include the issuance of more permits over-the counter, improved translation services, and the option to pay by credit card. Learn more about the building permit process and fees here. Source: Building Permit Records, Construction Valuation of Issued Building Permits. As more and more industrial business and housing come in, it is obvious that San Leandro is underserved in services like better restaurants, ( fresh Sprouts type) grocery, shopping and parking too. I’m hoping that some other areas outside of our busy downtown develop these services as well, so that flow, traffic and personality grows appropriately throughout. North of Kaiser SL has a perfect spot for Sprouts. yes we need more better quality restaurants, Grocery store at minimum1 if not 2, good quality fitness center. San Leandro really needs a sprouts. And some more breweries, preferably on the marina. Is there a plan for the unsed land next to Kaiser on Merced st?